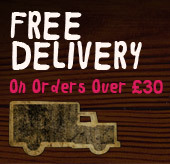 Our Bristol shop is now closed however we are still taking orders online. 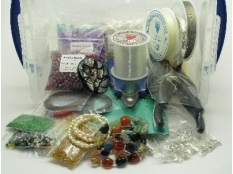 Beads for making jewellery - glass, silver & millefiori beads. 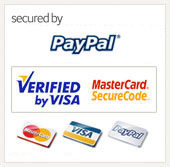 Search through our ever increasing range of beads, findings, cords, chains, wires and tools from the comfort of your home! Some of the different beads you will find on our website are glass, wood, coconut, bone, horn, shell, ceramic, fimo, buttons, charms, vegetable ivory, tagua, fresh water pearls and Thai Hill Tribe silver. 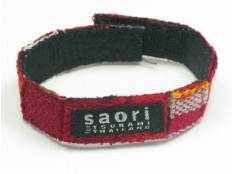 We stock a wide range of cords, wires and chains in different materials and thicknesses. 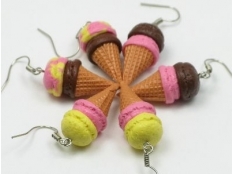 Apart from our webite we also have a bead shop located in the wonderful City of Bristol. 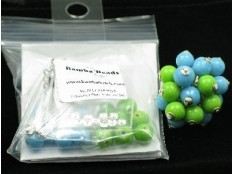 With the simple effort of clicking your mouse, you can find all the beads for jewellery making you could ever hope to imagine at bambabeads.co.uk. 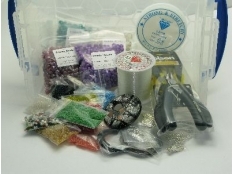 We have the widest range of beads for jewellery making from all over the world, along with cords, chains, wires and tools that you will need to assemble any piece of jewellery that your imagination can conjure. 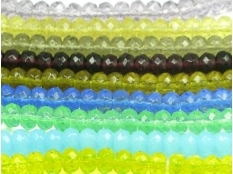 Bamba beads have glass beads of every colour of the rainbow and in plain colours or patterned inside. You can find round, oblong, cylindrical, faceted or square and pressed glass beads in bottle greens or glittery gold and smoky glass. There are pumpkin shapes and oblongs and squares that will look sensational mixed with beads of other materials and sizes. 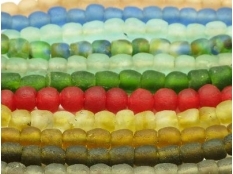 Semi-precious beads are a specialty at Bamba Beads. 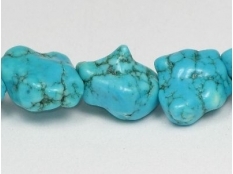 You will find a wide assortment of gorgeous individual gemstone beads or strands for those who need several of the same for their design ideas. Soft purple agates, black agates, Indian agates, aqua heliodor, carnelians in soft to deepest orange shades, turquoise nuggets, golden striped tiger eyes, white quartz, pink quartz, pyrite, butter jade and moukaite are only some of the semi-precious beads available. If you need to add a sparkle of colour or brilliance to your design, then crystal beads, with their precision cut and elegance, are always available in subtle or brilliant colours and different cuts and sizes. The machine-cut and polished facets offer exquisite style at an affordable price. Crystal beads, whether small and mixed with other beads, or larger and the centre of a piece, always dazzle with their perfection. Some people may want to make something with an ethnic handmade feel and with a down to earth look and wooden beads are perfect for this purpose. 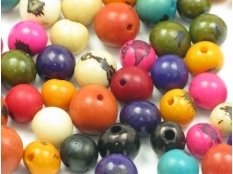 Bamba Beads have a diverse selection of wood beads - the natural adornments that have been around for centuries - and at Bamba you can choose from an extensive collection of different types of wood, shapes and colours. If your design needs to incorporate a smaller element, then seed beads can be used alongside other types of materials such as pearls or wood or crystal to create a soft, natural design. They come in different materials and sizes, and if you want a luxurious and elegant look with numerous strands of single or multi-colour rows, then seed beads will help you to create this image. 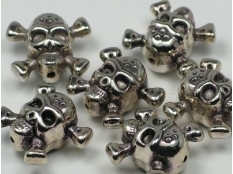 Those on a tight budget will find a full range of cheap beads for their needs. Sometimes a few inexpensive items can offset a more valuable stone and the combination and contrast will look remarkable and noticeable in the juxtaposition. 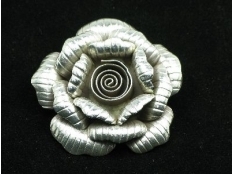 Buri twine, metal shell and other low cost cheap beads can allow you to spend a little more on the higher end beads for the piece you are creating. 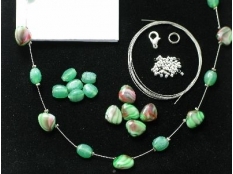 No piece of jewellery can be complete without having some sterling silver beads and at Bamba Beads you can find sterling silver beads from India, Thailand hill tribes and other parts of the world. We have every kind from simple sterling silver beads in basic shapes to more intricate filigree designs such as flowers and butterflies. 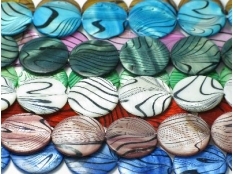 Lampwork glass beads can be as plain or as decorative as the artist likes. 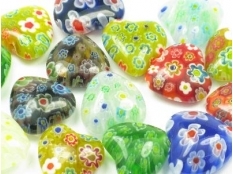 Multiple layers of glass are often used in making these lampwork glass beads and small dots of colour can be seen as bumps on the bead's surface or in the centre where they form floral-like designs. 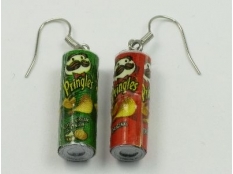 Long ago glass jewellery was reserved for the royalty as the artisans kept their glass making skills a secret. Today, lamp work glass beads are still an artisan's dream. Millefiori is the Italian for thousands of flowers and each flower is made by layering glass on top of each other - similar to how they made rock candy. It is then stretched and sliced to make millefiori beads. 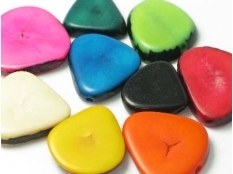 Bamba Beads carry a wide selection of millefiori beads in many colours and shapes including round, heart, oval, rectangle and cubed. To make your creation, your imagination is the only limit.